Disclosure: I received a sample from the vendor in order to write up an honest review. All views shared are mine and mine alone. Recently, I was given the opportunity to review one of the Dream Team Pets with my girls, who are 3 and 4 yrs. old. This child's sleep aid couldn't have come at a better time as we have been trying to transition our youngest out of our eldest daughter's room and into her own big girl room. She has been reluctant due to supposed scary monsters in her room. As a result, either my husband or I have been sleeping with her until she falls asleep, and then we sneak out. Our oldest is seeing the extra cuddle time attention at bedtime her little sister is getting and has also started to fuss and fight to go to sleep, so that we will go in and sleep with her, too. "Dream Team Pets is much more than a bedtime toy-it's an innovative kid's sleep aid that helps end the bedtime battles of trying to keep your child in bed. Developed with the help of a pediatrician, Dream Team Pets bedtime routine empowers kids as they reward their Pet with stickers and a certificate for a good night's sleep. If the child wakes up from a nightmare, there are no hard feelings because the responsibility is on their Pet, but when they successfully sleep in their own bed, the kids feel a sense of accomplishment as they reward their Dream Team Pet. What makes this unique is that the kids think they are training their Pet, but really they are sleep training themselves!" 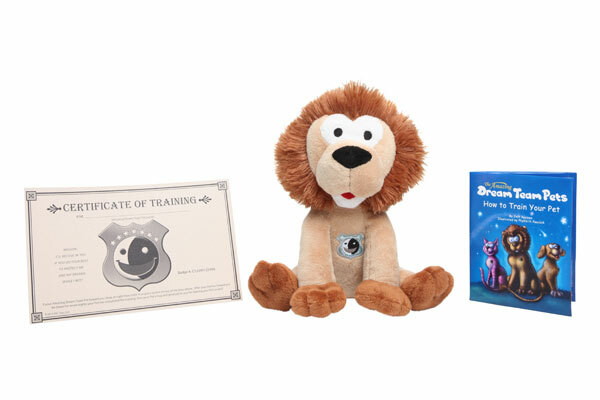 Upon receiving the Dream Team Pet, we started by reading the cute little story, which comes as a hard cover book, and then followed up by showing them the certificate and gold stars they are to use to track their new pet's bedtime success. The girls loved the story and idea of having to train their pet to sleep through the night in order to receive a gold star. I, however, wasn't sure if a plush toy would actually help them to fall asleep and stay asleep, but after the few weeks of bedtime struggles, I was up for trying anything. And, to my surprise the Dream Team Pet worked. We gave the Dream Team Puppy to Bella (our youngest) to sleep with, and ended up picking up another Dream Team Pet the next day so that both girls could have one. We are now 2 weeks into having our Dream Team Pets, and they are trained, sleeping through the nights...and so are my girls. Who knew that a plush animal with a cute story, certificate and gold stars could solve our bedtime woes with our girls. We had tried everything up until receiving these bedtime friends, but nothing worked. Just for Inspired by Savannah readers, get 30% Off Dream Team Pets the innovative child sleep training toy when you use special promo code USFGUIDE at checkout over at Amazon. The Dream Team Pets retail for only $19.99 each before the 30% discount. I have seen these and they are just adorable and a super cute Christmas gift.